We woke Charlotte at 6 a.m. today for our 6:30 a.m. at Lurie Children’s. She was not thrilled to have to start her day without breakfast, but she loved leaving the house in her pajamas. The wonderful anesthesiology resident, Dr. Jackie Morano, explained the sedation procedures to Charlotte and offered her a choice of flavored masks for the “laughing gas.” She began to explain the rest of the procedures and I could feel Charlotte tensing up. With her increasing fear of needles, Charlotte began to get hysterical at the notion that anything would still be in when she woke. Jackie’s phone pinged–Dr.Hubert Benson texted to say, “So you made her cry already?” You see, he and I had had a lengthy consult yesterday about Charlotte’s fear of needles and from his position outside the room, he knew exactly what was going on, so he was teasing Dr. Morano. Never leave home without it…Charlotte and Bubba, and the iPod. When Dr. Benson came in we further discussed needles (the IV for the contrast dye would placed AFTER Charlotte was asleep) and IV port (the “straw) from the IV will still be in her arm when she wakes up). We also talked about the flexible breathing tube and waking up with a scratchy throat. Jackie showed Charlotte the flexible, tiny plastic “straw.” Charlotte relaxed immediately and even smiled. Jackie then explained to Charlotte how the doctors needed her to breathe and hold her breath “just so” in the MRI machine, and that it would be so much easier to let them do it for her, thus the anesthesia and the breathing tube. Given her needle anxiety, Dr. Benson recommended a “relaxing drink” before heading back to the MRI room. He even offered it “on the house” (winking to us that insurance would cover it). 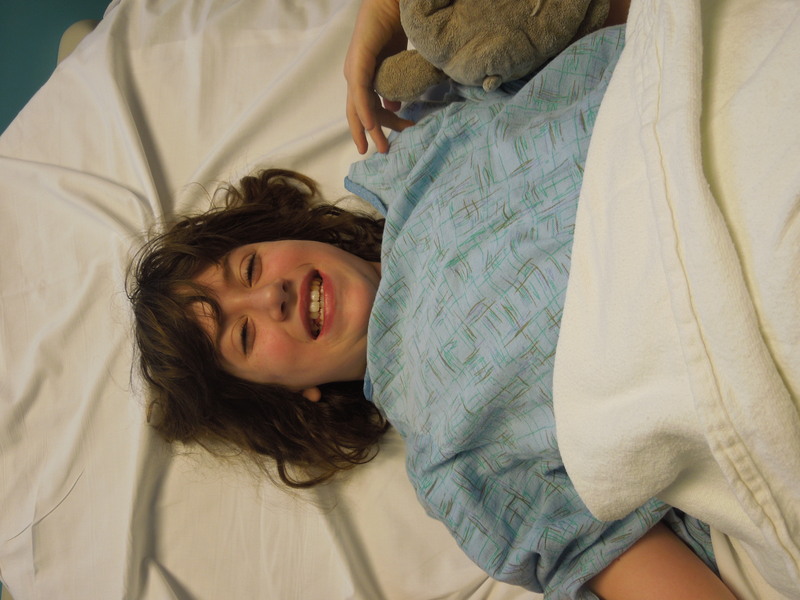 So, dopey from versed, Charlotte giggled her way back to the “Den,” the MRI lab. “Look, the Caution Sign looks like a Minion. Hee hee.” “What’s a Minion?” (Dr. Benson) General ribbing of the doctor by the nurse, Charlotte, his resident and us ensued! That was at 8 a.m. Now we wait for the call that she is in recovery. Once she’s ready, we’ll go home to sleep it off. We won’t have results or further information about the diagnosis and repair plans until Tuesday. For the moment, our only real concern is that Dr. Benson had no idea what a Minion is. How is that possible?! 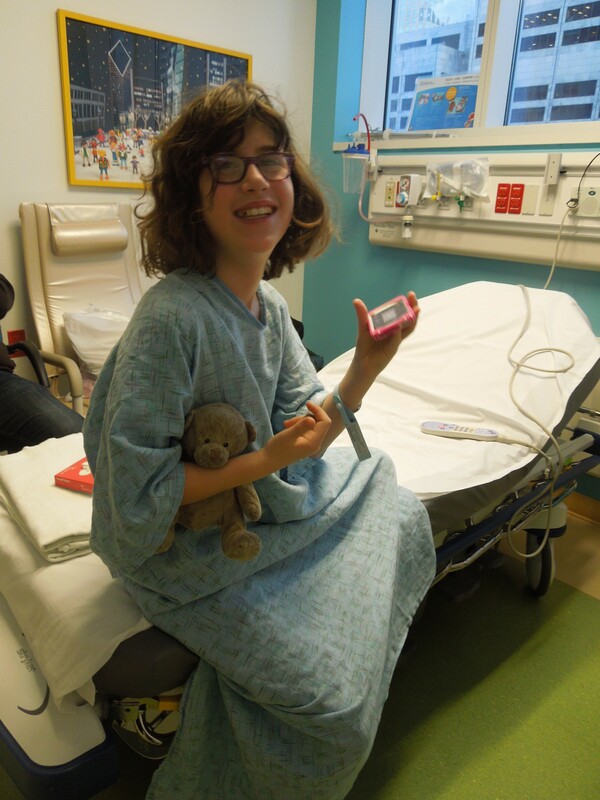 Categories: cardiology update, CHD, MRI | Tags: Ann and Robert H. Lurie Children's Hospital | Permalink.